The Athina B, a Greek cargo ship, ran aground on the beach just east of the Palace Pier, in front of the Aquarium on January 21 1980. She’d set out for Shoreham from the Azores on December 11 1979 loaded with 3,000 tons of pumice. On arrival at Shoreham, heavy seas and force 7/8 winds prevented her entering the harbour. As the weather deteriorated, she drifted eastwards. The Shoreham lifeboat rescued the captain’s family and half the crew in the morning, and the ship survived the pounding of mounting seas during the day. At 9.15pm the captain and remaining crew were rescued, after which the boat ran aground on the beach. She was declared a write-off and remained on the beach for a month before being re-floated and towed away to a Medway scrapyard, near Rainham. The shipwreck of the Athina B is commemorated by its anchor, which is on the seafront near Palace Pier. I’ve always believed the shipwreck to be a sign of the arrival of my brother into this world. His first cries in Southlands hospital (nearer to where the Athina should have ended up) were in tune with the ships grounding on Brighton beach. If it was meant as a warning, I think we should have paid more attention. While sorting through black and white negatives to put to CDs, I found the pictures I took of this ship. My sister and I travelled down just to have a look. I still can’t believe it was that long ago. Does anyone know anyone who WASN’T there when the Athina B mounted Brighton Beach? Everybody I know made the trip to see her. I recently found a photo my Dad took of me (aged 4) and my brother (still in a buggy) alongside the amazing sight. Yes, my brother was there. He was about 13 in a checked brown coat. I remember the Athina B. I was eight years old when it happened. I saw the vessel on the beach with my family too. I find this topic so interesting, but there’s not many web sites about it. I find the same about the raising of the Mary Rose. That is also an interesting topic, but the Mary Rose Trust lack the websites. 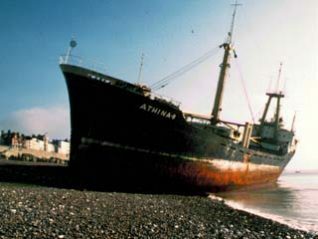 Anyway, back to the Athina B, I’d love to find out more information about that ship before she was grounded on Brighton beach. I’d also love to find out what happened to her after she entered the scrapyard. Was she stripped for scrap or does she still exist as a part of history? Where is Rainham where the scrapyard is near? This topic is so interesting. I remember going on a school trip to see the wreck. I still have a small amount of the pumice stone cargo in a jar somewhere at home. I took my two daughters and two nephews plus Oscar our dog down to the seafront to be astonished by such a sight. It was a fascinating but cold day out for all of us! I too made a trip down to see the ship on the beach, as it was the picture one just had to have. I vaguely recall mention in the press at the time that she had been condemned before commencing the voyage and was refused entry to harbour due to her condition and the risk of her sinking. Anyone know anything about that? What an eye-opener that was. I’ve just been converting some old negatives and found half a dozen or so dramatic images of the wreck with waves crashing over it. The storm alone took my breath away! I remember the time my family and I went to see the Athina B. I find this topic so interesting. I read the Athina B was towed to a ship scrap yard in Rainham, Kent a month later. I saw an estuary at Google Map that shows other ship wrecks but of course, the Athina B was broken-up years before. I read two sides of the story about how the Athina B got grounded on the Brighton beach. One was, the Athina B had engine failure and the coastguard got the crew off and the Athina B was left drifing and got washed-up on the beach during the time. The other side of the story is, one foggy night when the crew were heading for Shoreham harbour, they saw lights and thought they were arriving at Shoreham Harbour and they thought the lights were part of the harbour, instead the lights were from the Palace pier and the crew steered the Athina B up on the beach by accident. Some people have said this happened in 1979 but most of the time it’s said it happened in 1980. I believe the story about engine failure because the Athina B did have to have repairs in France just before making her way to England. I too visited the wreck. The interest in her was huge: crowds and traffic packed the front. Even though she was actually quite a small vessel, on the beach, out of her natural element, she looked huge. Though she was just a pile of scrap iron, irrationally, I felt sorry for her. It was an undignified end, turned into an end of pier show and an opportunity to shift a few over-priced burgers. I believe the Captain refused the help of a tug that had come to his rescue, because of the salvage rights. It was very sad to see the ship there, however Brighton was as busy as it was mid summer. They built a road for the lorries to drive up to the ship and unload its cargo. I drove all the way from Ramsgate in Kent, with my two children to watch the ship going back out to sea, but we arrived too late and she had gone, so we went to visit my mother instead. For more factual info on this story with photos, try this link:- http://www.flickr.com/photos/33037982@N04/7058045761/in/contacts/ It’s also interesting to note that pumice is a very bouyant material which probably helped from total disaster. If the cargo had been iron or other mineral ore she probably would have foundered further offshore. I was born in Brighton but lived in Shropshire, I remember visiting my nan Gladys who lived in Ditchling Rise and collecting some pumice stone off the beach from the ship. Happy days! For some reason, my girl friend and I decided to take a walk along the beach after a meal in a local restaurant. It was a dark windy evening and we we surprised to hear voices and noises coming from the blackness of the sea. We assumed it must be from a boat or ship and that the voices and noises were being carried a long distance with the wind. In the morning when we left early for work, we were shocked to see the sight of a large ship on the beach as we drove towards the se front. We rushed home to get a camera and then walked right up to the ship to take photos. There was no police or anyone to stop us and I have some good shots taken at the time. It was in the very same area where we had been walking the previous evening so we guessed the voices were to do with this ship wreck. The remarks made by Paul (31/01/2011) may be right, however he was unable to read my message as it says ‘Brighton was as busy as it was in mid summer’, not that it was mid summer. I lived on the seafront at the time and saw the wreck every day. there were a lot of rumours going on about it the whole time it was there. I heard about the sea tug on the local news - where did the other Paul get his information from? I seem to recall that there was a similar shipwreck in the 60s. Does anyone remember that, and the name of the vessel concerned? I don’t think it was ever floated again. The scrapyard in Rainham was run by MSM @ Bloors Wharf. My father was one of the guys in charge of getting it refloated and to the yard (where he worked). I remember him taken me to Brighton to ‘see what he was working on’. The Athena B was towed back to the scrapyard in Rainham at Booked Wharf by my dad John Brooker where him and the boys cut it up for scrap. I listened to the story all the time and still have photos of it being towed up the Medway by my dad’s tug. Although the Athina B was towed to Rainham to be broken up I do not think it was completely cut up, if you go to Motney hill in Rainham which is adjacent to where the breaker’s used to be, the hull of the ship is still sitting on the mud flats. Whilst working as a stevedore in Shoreham Harbour, we were in on overtime waiting for the Athina B to dock so we could unload the pumice which was used to make concrete blocks. Unfortunately, we watched her sail by because of engine problems. At a later date, some of our stevedores and a crane unloaded the pumice. She was then sealed up and towed away. I believe the ship’s bell is still in existence, but not sure where.